Pangolin scales seized in Douala, March 19, 2019. International trade in pangolins was banned in 2016 under the Convention on the International Trade in Endangered Species (CITES). But the trade continues. Police in Cameroon have arrested four wildlife traffickers caught with huge quantities of elephant tusks and scales from pangolins. 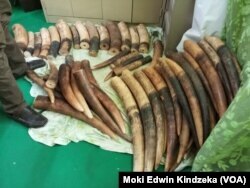 The traffickers, said to be operating across Africa, were planning to transport the scales and ivory to Asian countries through Nigeria. "These traffickers are very top professionals," he said. "They know the mechanisms of corruption extremely well. They are international, they are young, they turn to move from where there is strong wildlife enforcement to where wildlife law enforcement is not very strict. Traffickers are given lenient treatment, which is a very wrong signal."